New space needn’t be as expensive as you thought Gary Warby, Director Premier Windows Aylesbury explains how hybrid conservatories or solid conservatory roof extensions could be the answer to your prayers for more space. Conservatory design have significantly changed. New glazed extensions and hybrid conservatories offer homeowners a great way to add new and highly flexible living space to their homes. Innovation in glass technology has been key to this shift. Energy efficient and solar reflective glass can ensures that contemporary conservatories offer comfortable ambient year-round temperatures. But the real shift is in how this technology is being used with internal plasterwork and even thermally efficient solid roofs to give homeowners all of the flexibility of a ‘bricks and mortar’ extension but at considerably lower cost. Hybrid glazed extensions combine a core glass conservatory structure but by bringing more brickwork into the design and by adapting the conservatory roof, they emulate the appearance of an orangery but at far lower cost at a mid-range price point. The options are endless but technical innovation means that all will give you a flexible and versatile year- round living space and add significant value to your home. We supply the LivinRoof which brings you one step closer to a traditional extension – but as a glazed extension, at the fraction of the cost. Featuring an internal perimeter pelmet, the solid and glazed roof system can be configured to almost any design, featuring as much or as little glass as you decide. Internally-plastered the vaulted ceiling creates a sense of openness, while glazed sections bring light into your room. Externally finished in a contemporary urban grey and cornice, the LivinRoof adds stylish and almost limitlessly adaptable new space to your property. The other option is to go for a solid roof glazed extension. We supply the UltraRoof. It’s a modular solid-roof system which emulates the appearance of a traditional batton and tile roofing system but is far more thermally efficient and quicker to install. Able to accommodate roof pitches of 12.5° to 41°, it means that the UltraRoof can be fitted and water tight in as little as a day, so you don’t have to live with builders for weeks on end. Inside, the addition of plasterboard forms an airy vaulted ceiling, with internal soffit, for housing down-lights and internal cabling. Depending on your roof, it can also be designed to accommodate Velux-type roof lights or lower cost fixed window lights. The other great thing about the Ultraroof is that it’s lightweight, which means that it is also suitable for retro-fit to lots of existing conservatories as a replacement roof, depending on the shape. It means for a comparatively low cost you can add a solid-wall and a solid roof, completely transforming the appearance of your existing conservatory. According to peer-to-peer lending service Zopa, adding a conservatory or orangery to your property delivers the single biggest return on investment of any home improvement, with an ROI of 108 per cent and typical profit of £5,700. 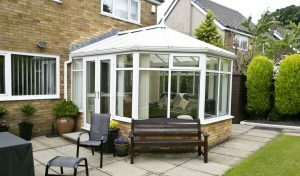 The Royal Institute of Chartered Surveyors makes a similar assessment, suggesting that the addition of a conservatory or orangery will increase the value of your property by around five per cent. It means that contemporary conservatories, not only offer you a highly cost effective way of adding space to your property – but even better, they’ll add value to it.